Potatoes may not be the first thing that comes to mind when someone mentions spring produce to you, but trust us when we say that this salad will soon become one of your favorite ways to celebrate the return of warmer weather. Sweet, tender little new potatoes are almost an entirely different vegetable from their hardier, cold-weather cousins. Thin-skinned and with incredibly buttery flesh, they raise an everyday Niçoise salad to a whole other level of deliciousness. For this salad, we used our Sunburst Blend bite-sized potatoes, a mix of organic, red-skinned Ruby Sensations and creamy, yellow-skinned Honey Golds. As more seasonal produce starts to arrive and the weather gets warmer, you can riff on this basic recipe to with additional touches of spring. Fresh morels that have been washed and boiled make a lovely, earthy addition, as do sweet peas, peeled and blanched fava beans, chopped ramps, sautéed fiddlehead ferns, or sliced radishes. Place the potatoes in a medium saucepan filled with well-salted water and bring to a boil. Cook until the potatoes are cooked through but still hold their shape, about 15-20 minutes. Remove the potatoes with a slotted spoon and set aside to cool. Next, add the haricots verts to the boiling water and cook briefly—just 2-3 minutes. They should still be bright green and have a little crispness to them when you bite into them or snap them in two. Remove the beans from the boiling water and shock in an ice bath to cool them down. Drain well, pat dry, and set aside in a bowl. Cut the potatoes into ½-inch slices and add to the bowl along with the beans. In a small bowl, mix together the vinegar, Dijon mustard, salt, and pepper. Slowly add the olive oil to the bowl, whisking constantly so that the mixture forms a smooth emulsion. Taste for seasoning and adjust as needed. Drizzle a quarter of the dressing over the potatoes and beans and gently toss to coat. Arrange a bed of the mixed greens on a platter. Drizzle a quarter of the remaining dressing over it. 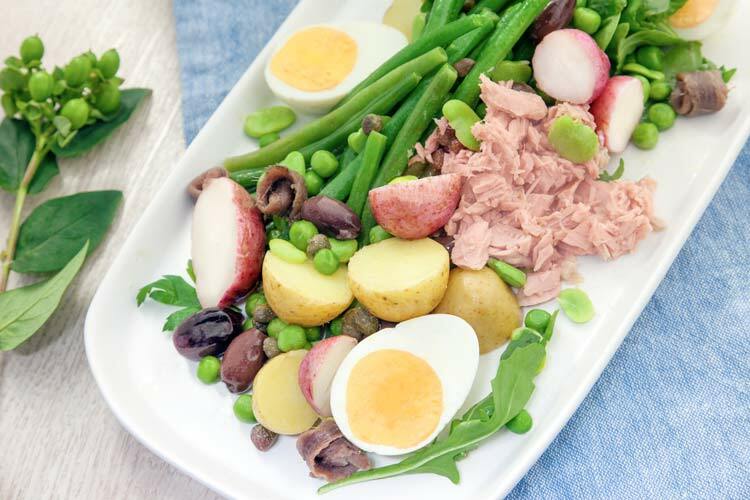 Distribute the green beans and potatoes over the top, followed by the tuna and the hard-boiled eggs. Drizzle with the last of the dressing. Scatter the olives, parsley, capers, anchovies, and any other additions on top to finish. Dust with a pinch of cayenne pepper before serving.